March 06, 2017: Force Trump 40 is a small load carrier offered in diesel and CNG variants in India. The diesel variant returns a mileage of 21 kmpl. 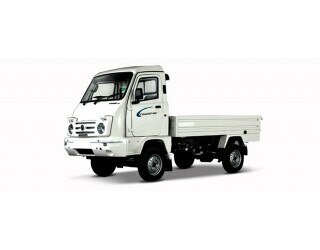 This commercial vehicle from Force Motors is available in both high and flat deck options. It supports a maximum payload capacity of 990 kg. Force Trump 40 comes pre-loaded with a tiltable power steering, parking brakes, tubeless tyres and adjustable driver seat. It is pitted against the like Tata Ace, Mahindra Maxximo and Ashok Leyland in India. Force is one of the very few Indian automobile makers who have made it big in both commercial and passenger vehicle segment. With vehicle ranging from SUVs to Pickups, the company now holds a prominent place in the market and Trump 40 is its face in small commercial vehicle niche. The mini truck is a solution to all small business needs with fuel options of diesel and CNG. Also, the faster turnaround time, longer service intervals and comfortable yet safe interiors have also played a substantially role in making it a popular choice among buyers. Backed by Water Cooled 3-Cylinder TG 2000 F DI 1,947 cc Diesel and CNG engine with Sequential Injection, Trump 40 offers decent top power of 39 hp @ 2,600 rpm with diesel and 41 hp @ 2,700 rpm with CNG engine. The torque, however, remains same with 124 Nm @ 1,400 - 1,600 rpm. Mated with 4-Speed Synchromesh gear transmission box with Dry Single Diaphragm Clutch of 228 mm diameter, Trump 40 easily hits decent top speed and generating enough gradeability to conquer the heights. The only wheelbase option of 2,370 mm with turning radius of 4,500 mm makes Trump 40 an easily movable mini truck on sharp turns and narrow roads. The truck is available in body type options of Hi-deck and Regular deck for diesel and Hi-deck only for CNG fuel option. The overall L x W x H mm dimensions for diesel and CNG options are 4,395 x 1,580 x 2,132 mm and 4,395 x 1,580 x 2,130 mm. The cargo box measurements for both Hi-Deck variants are 2,670 x 1,480 x 1,830 mm while the Regular Deck version has dimensions as 2,670 x 1,480 x 327 mm. Although the ground clearance remains same at 162 mm for all 3 variants. Talking about the load capacity, Trump 40 could lift up to 2,500 Gross Vehicle Weight (GVW) irrespective of the variant. However, the kerb weight & payload for diesel Hi-Deck, Diesel Regular Deck and CNG Hi-Deck are 1,430 kg & 1,070 kg, 1,350 kg & 1,150 kg and 1,510 kg & 1,990 kg, respectively. Force Trump 40 although has mechanical steering, but its good enough for maneuvering without getting driver too much fatigued. Also, the relatively decent turning radius of 4,500 mm plays a crucial role to dodge the turns and narrow Indian roads. For a bump free ride, all the variants have Semi Elliptical Leaf Springs at both front and rear with Hydraulic Telescopic Shock Absorbers as extra add-on and front & rear Anti Roll Bar for CNG Hi-Deck option only. Also, while the diesel mini truck variants have Dead Rigid front and Live rear axles, its CNG counterpart has Rigid only front and rear axles to offer needed balance on the trip. With Hydraulically Operated Vacuum Assisted Service brakes aided by automatic wear adjuster, the front Disc and rear Drum brakes in all the Trump 40 variants work really well to help driver strop at safe distance regardless of speed and load getting carried. The company had offered more safety by opting for Durable Pressed Sheet Metal Ladder Type Chassis and tough construction parameters for all roads to meet the harshest of conditions. Aesthetically, the Trump 40 is not one of the eye-catchy mini trucks but has enough features to compete the contemporaries. Inside the cabin too, there only are necessary features like comfortable seats, seat belts, adjustable seats and others.